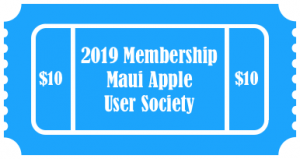 We have tried to keep the essence of this site – which is focussed primarily at members of the Maui Apple Users Society simple. That said it contains a wealth of information that we will continue to grow and index. Home – the home page of the site will fee blog posts relevant and important to our members – right at the top of the page will be the latest information that pertains to you. About Us – provides a little background to who we are and what we do. Blog Posts – where the majority of the content of the stream can be found. Special Deals … note that this page is password protected. As a PRO MEMBER of out User Group, you will have access to this password where we will put links to deals that are ONLY available to User Group Members. (Note that these deals are very different to the bundle packages that we promote in our blog stream – they are unique and SPECIAL. Topic – Hardware, Software, iOs etc ? Type – is the information news, an announcement, special deal ? Date – when was the information posted ? All three categorizations can be found on the right hand side. There are many ways to keep up to date with this blog – and we hope you do. 1) Keep coming back to the blog – and you will be able to see the latest posts. 2) Wait for our occasional news letters – and we will be sure to include links to some of the posts. But – to keep it brief – it actually stands for ‘Really Simple Syndication’, and in simple terms is an internet protocol that allows you to easily check all your interesting places on a regular basis. If you look to the right in the navigation column, you will see a section on community – where you can follow us on Facebook (go on do it now, one less thing to do later), check out our Event Calendar – or subscribe to this blog (thirf link beside that orange icon). Click on it and you will be ‘auto magcally’ taken to our feedburner page where we track our subscriptions – and asked to subscribe with your favorite news reader. If you don’t see your favorite one – like google, or yahoo, newsgator – try out the drop down box and select there. You will see in the graphic above NetNewsWire is selected – that happens to be my news reader of choice – free and available for download from here. NetNewsWire gives you all the benefit of a desktop client – but also automatically synchs with Google News Reader – which I like to use on my phone (NewNewsWire does have an iPhone client (again free) – but I have so many feeds that it is slow – with Google Reader, I get the bits I want – on demand – and very quickly. As a point of interest – this is a snap shot of my version of NetNews Reader – you will see I have over 41,000 unread news items (no I don’t read them all). – and they break down into folders I have created around my areas of interest – my personal and business blogs, apple, marketing, maui, music – you get the drift. So – whatever frame of mind I am in – i can go pick up the latest news in a single app – right there – right then. 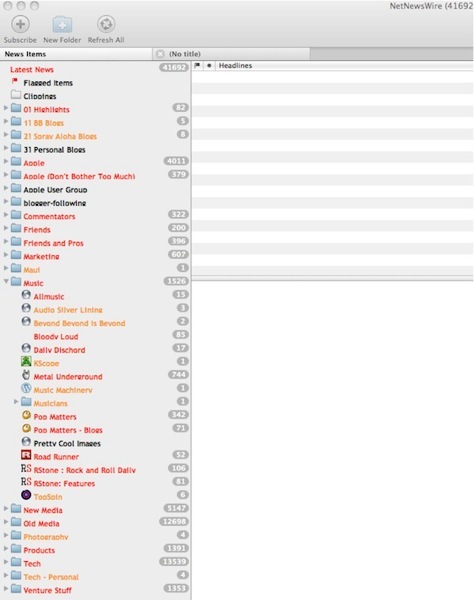 Powerful – know that I have not paid for any of the apps I run, nore any of the feeds – and there are around 260 seperate places I pull from including newspapers, magazines, business blogs, pro bloggers, friends etc. all contribute to creating my personal newspaper. If you are still stuck – and want to know more – have no hesitation in contacting me :: jphilpin [at] me [dot] com. And maybe we will run a demo and RSS discussion at the next meeting ? Let us know.